Built in 1934, Bridge No. 1132 carries Route 80 over the Hammonasset River between Madison and Killingworth. The river runs in a deep ravine at this point, some 45 feet below the roadway, so the open-spandrel design was well-suited to the location. In addition to the 100' river arch, the bridge includes three concrete-girder approach spans at each end. The bridge’s floor beams provide cantilevered supports for the 30' roadway, which rises at a 4% grade going west to east. Notable details, preserved intact during several episodes of rehabilitation and repair, include arched openings between the columns, recessed panels on the piers at either end of the arch, and railings with square balusters. 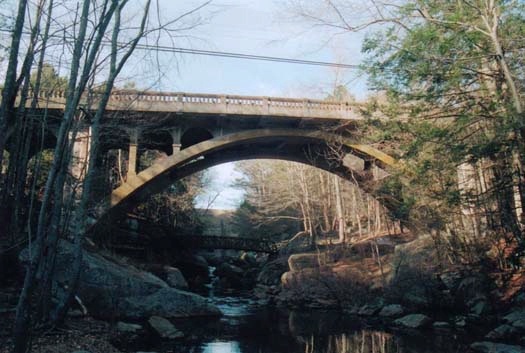 North of the bridge is a footbridge serving fishermen and hikers and beyond that, the concrete dam for the Lake Hammonasset reservoir. 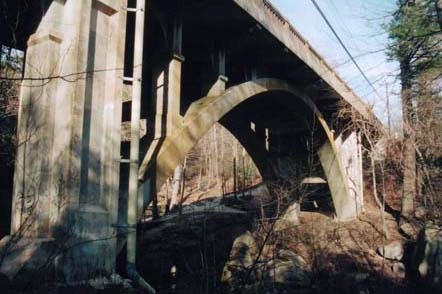 The soaring arch ribs of this bridge were thought to complement well its scenic surroundings, and the State Highway Department included Bridge No. 1132 as one of eight notable bridge projects in its 1935 history of Connecticut highways. Take a look at the original Connecticut Highway Department drawing for this bridge. (the bridge's location will be indicated by a blue push pin).